For the past couple of weeks, I have been sticking to my Back to Basics approach to tangling, partly to escape the feeling of being overwhelmed by so many new patterns emerging, partly to remind myself of the patterns I learned almost a year ago when I first started tangling. 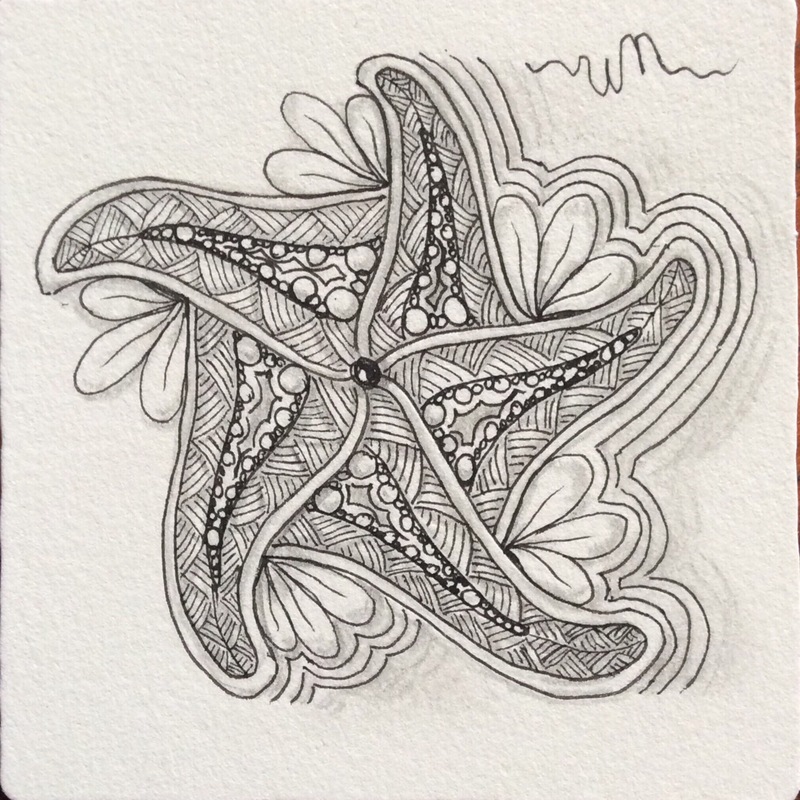 Using the Zentangle Primer, Volume 1, by Zentangle founders Maria Thomas and Rick Roberts, I started again from the beginning of the book, re-doing all the exercises with fresh eyes as well as accumulated experience. The very simplicity of the way I tangled through the first six lessons helped me touch base with the reasons I started tangling to begin with–to relax and re-center my mind, to let go for a few moments of the demands of the world around me, to remind myself that I can still learn new things and create. And so I kept things simple–nothing fancy or extravagant; just the original tangles presented in the Primer, without embellishment except as the exercises required. 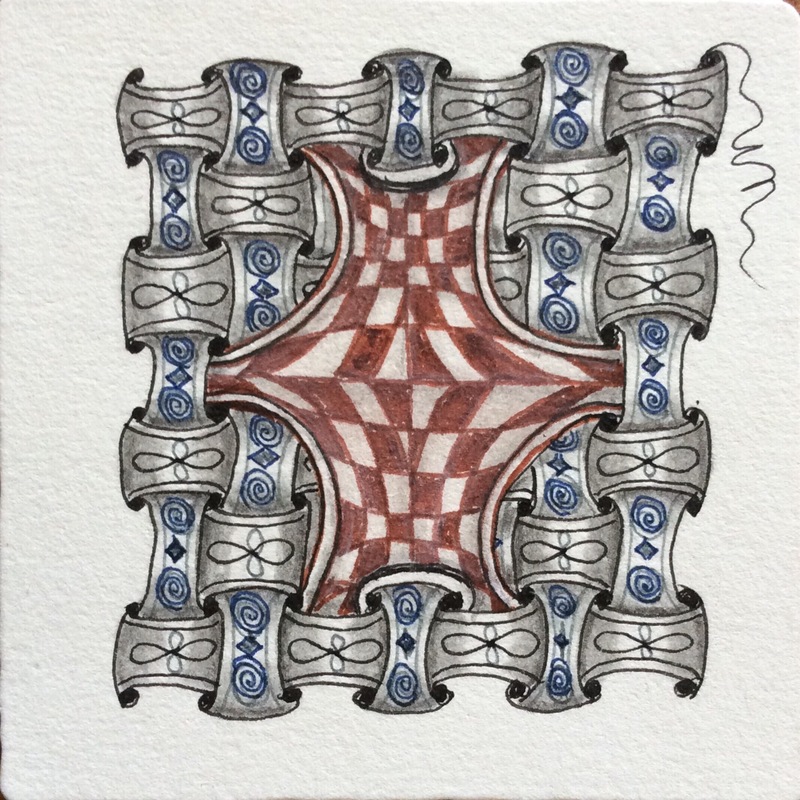 The tiles and tangles below are studies based on some of the Lesson 6 featured patterns and related exercises. 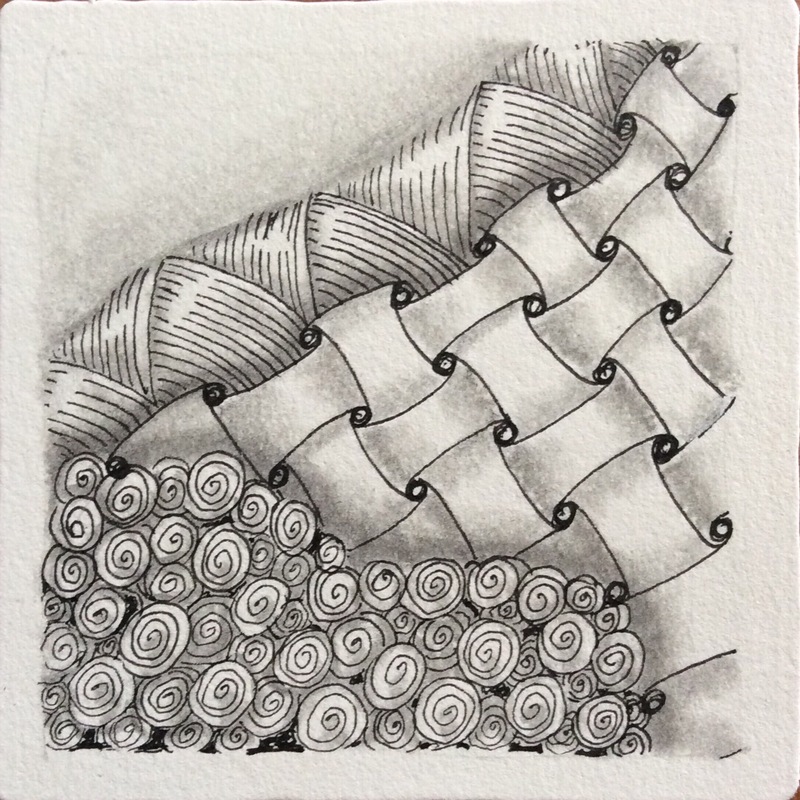 The order of things in the Primer allows the tangler to build artistic and Zentangle techniques as well as an arsenal of patterns that naturally spring forward during a meditative tangling session. Four basic patterns are introduced in the first chapter, three more in the second, one “correction” pattern in Chapter 5, and fourteen (15, if you count two versions of Flux separately) in Chapter 6, with the third through fifth chapter dedicated respectively to strings, shading techniques, and creative means of turning mistakes into new tangling opportunities. All of this information is presented using only the first seven tangles. 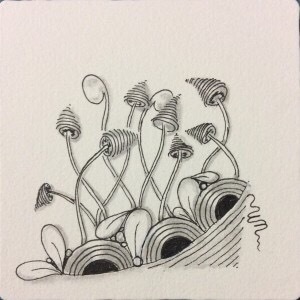 The purpose is to not only show the abundance of creative tiles that can be produced by only seven patterns, but to also explore artistic techniques and elements of the Zentangle Method© and philosophy using the limited array of patterns which should become very familiar to the tangler as the lessons progress. Each lesson also encourages new pattern and design creation from two or more patterns, and provides suggestions for embellishment that make each pattern one’s own. Each time I work through these first chapters I try to vary the patterns I use, especially for the string and shading exercises in Chapters 4 and 5. Applying the exercises and techniques to newer or simply different patterns enhances the way I draw and use the patterns. This emboldens me to try new things with strings and with patterns new to me. Therefore, each pass through Primer provides not only new ideas for tangling, but serves as a reminder of classic drawing techniques and patterns and techniques that I forgot about as I picked up and used more and more patterns and as I developed my own style. This time through, I limited my tangling to only these first 23 patterns, concentrating on the first seven. There is always the tendency to use the newest patterns as one tangles, so that “older” and classic patterns kind of fall out of memory for a while. Working through the Primer again–or just using it for inspiration or a reminder of a technique–reminds me of what has become part of my style as well as of the roots of my tangling. Mostly, it reminds me why I began to tangle and why I continue to tangle, even if I temporarily become overwhelmed with possibilities and the idea of meditation seems to fly out the window. Next week I will concentrate on one of my favorite Back to Basics chapters in the Primer–reticula and fragments. But you figured it out. That’s the important thing! Now you can pass on what you learned to others. Based on your art background and Mosaic app contributions, you are well on your way! Thank you for sharing here!